Purple is a dialectic color: it’s the synthesis of cold blue and hot red. It stands for eccentricity, ceremony, mystery as well as mourning, transformation, and bruising. “Purple haze” is a state of confusion or euphoria, possibly drug-induced. The HR McMillan planetarium is where you can go to see light shows designed around Pink Floyd, Radiohead, Metallica, Led Zeppelin, and U2. The juxtaposition of light and sound is a spectacle and makes a lot of people want to visit the show under certain influences. 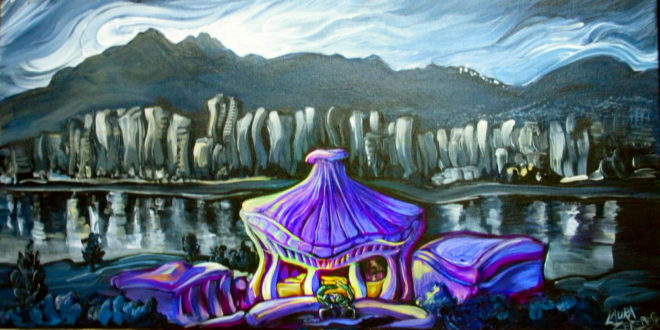 The design of the planetarium was meant to represent the ceremonial hats worn by the Haida indians. To me, it always looked like a mushroom. That’s what the title of the painting is based on: pluteus is a genera of hallucinogenic mushroom widely grown in BC. The light is during that shadowless period known as “magic hour” when the light is no longer direct but indirect and everything is muted. Or magical.